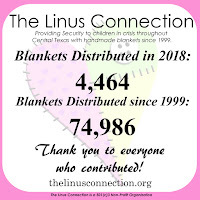 Single Layer Fleece blankets are fun, easy and fast and welcome by The Linus Connection to give warmth and comfort to children in crisis in Central Texas. 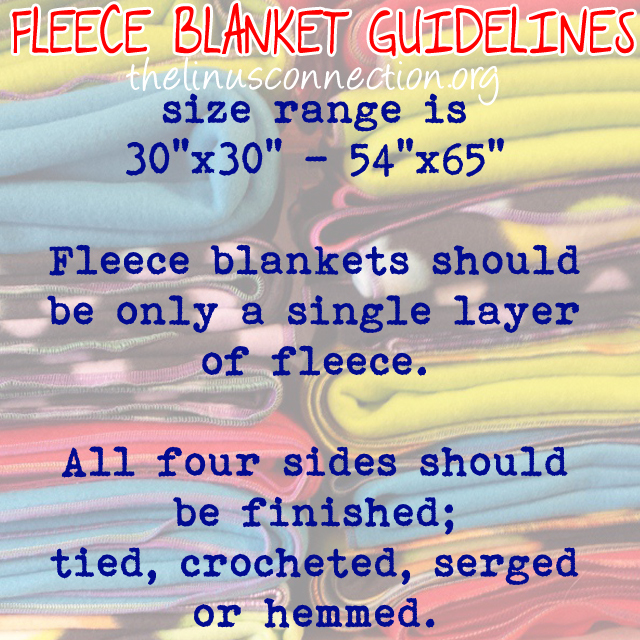 Follow our simple guidelines to help you create a blanket ready to be loved! All fleece blankets should be SINGLE LAYER. Double layer blankets (two separate pieces of fleece joined together) are not necessary in our warm climate. A single layer of fleece is perfect to comfort a child all year long. All fleece blankets should be between 30" x 30" to 54" x 65". 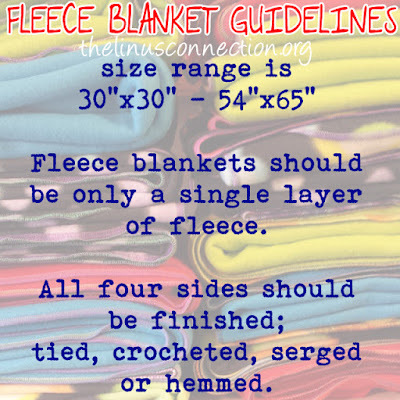 Fleece is typically 58" wide. When making a fringed fleece blanket, keep in mind there will be approximately 6" of fringe on each side. This tutorial used a 1 1/4 yard remnant, creating a fleece blanket approximately 45" x 58" (fringe included). A cutting table or other clean surface to work on. Start by squaring up the cut ends of the fleece. Ends should be nice and straight. 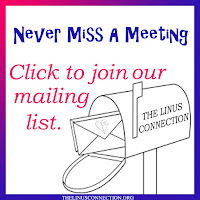 If using scissors, use Masking Tape to create a straight cutting line. Remove selvage, creating a straight line along the sides of fleece. When removing selvage, make sure lines are straight and corners are square. Once selvage is removed and ends are square, use masking tape to mark the "cut to" line for the fringe. Fringe will be 6" long so we have plenty of length to tie knots. Use one long piece of tape and one shorter piece of tape to mark off a 6" corner (shown). A 6" wide ruler is a great tool for this, but you can also use any ruler or measuring tape to measure along the side for masking tape placement. It's easiest to move the tape as you work on each side rather than adding the tape to all four sides at once. 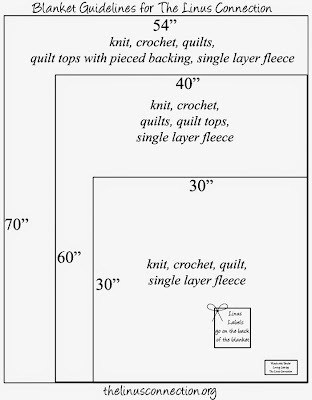 Remove 6" square from fleece corner using scissors or rotary cutter and ruler. This will allow your blanket to lie flat and give it a nice finish. After removing 6" square from the corner, place ruler on masking tape to use as a guide to create fringe. 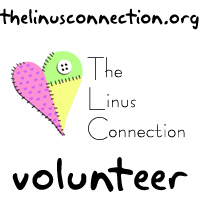 If using scissors, cut 1" fringe as evenly as possible to within about 1/2" of the tape. If using rotary cutter and ruler, cut 1" fringe stopping just before the tape with each cut. Repeat until all four sides have had corners removed and fringe cut. Cut fringe will look like this (corner shown). Starting from any point, tie a knot in each fringe. Fringe is not tied together, each is knotted individually. Continue around until each piece of fringe has been knotted. And, you're done! Easy peasy! Small round ceramic plate or saucer. Serger or sewing machine with an overlocker attachment. Optional: Ball Point needles for best results. Use a small plate or saucer to round corners. Cut around with scissors or rotary cutter. Rounded corners will look like this. Set your serger up for fleece. We highly recommend using your machine's manual for reference. Ball Point needles work best for fleece. Test stitch on a piece of scrap fleece to before setting to work on your blanket to ensure you're getting the best stitch possible. Use one color of thread or several for a fun effect. Multiple colors are great with solid fleece! 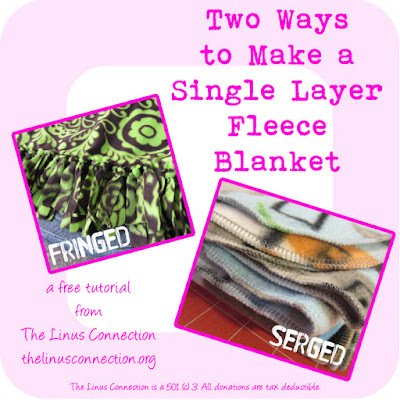 Pick a starting point and serge around blanket, using the serger's knife to cut off just enough fleece to ensure all edges of the blanket are enclosed. Serge around corners. This is easy peasy, just take your time. Slow down as you approach the beginning of the serged edge. Serge over the beginning of the serged edge, pulling fleece away and leaving a tail. Use Fray Block to finish lock thread in place. Once the Fray Block has dried, you can safely trim away the serged tail. You can also hand stitch or weave in the end to prevent raveling.